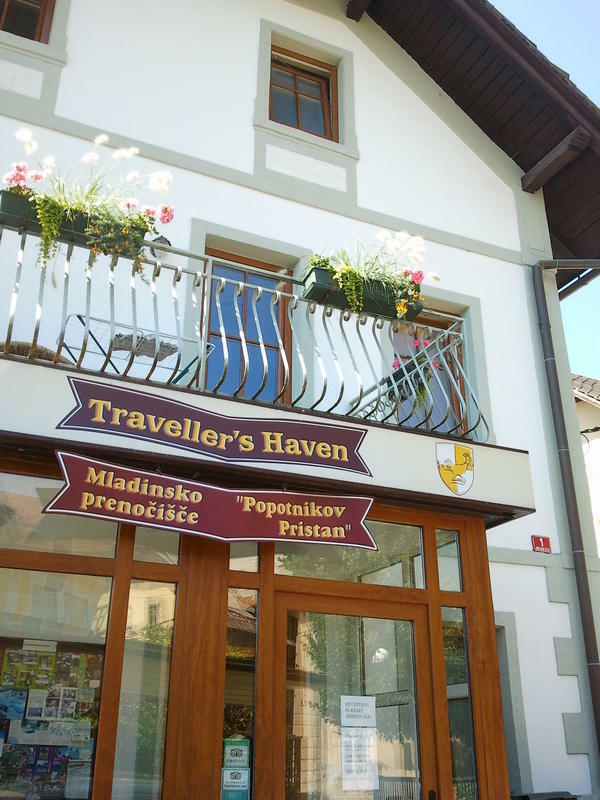 Traveller's Haven is located in the centre of Bled's residential district, located only yards from St Martin's Church at the foot of the spectacular cliff top Bled Castle. 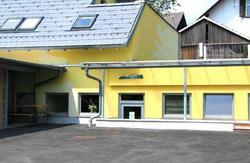 Our hostel is in a typical Bled house from the beginning of the 20 century in the old part of Bled. The hostel sleeps 27 people in five mixed dorms (4 bed dorm, three 5 bed dorms and a 6 bed dorm) and a double bed room. In addition to the rooms we have a fully equipped kitchen and a living room with wireless internet access. There is a shop across the road from the property where a huge variety of fresh food, supplies and toiletries can be purchased. * we offer free bikes and washing machines!!!! The lake offers a wide variety of entertainment from the leisurely to the active; sunbathing, swimming, diving, rowing, fishing etc. The Straza piste is located just across the lake from the hostel and is open for day and night time skiing in the winter months and roller coaster rides in the summer. Traveller's Haven is within walking distance of all the hotels, pubs and restaurants. There are many outdoor pursuit organizations for the adventurous visitors, as well as concerts and recitals for those who prefer less strenuous entertainment. A popular pastime, due to the aesthetic nature of Bled, is a walk or cycle around the lake. Bled is an Alpine resort of breathtaking beauty, like a picture post card of a Disney wonderland. The vibrant town surrounds a crystal clear, spa lake, fed by the pure, green, melt water from the Julian Alps. In the summer the rivers are cool and the lakeside, supervised pools, are warm for bathing. In the winter it is crisp, dry and cold. Some winters the lake freezes and Bled is engulfed in snow. The snow capped Julian Alps are the background to this fairytale scenery. Slovenes are well known for our love of the outdoors and this is the perfect starting off point for days of fun, surrounded by the outstanding scenery of Triglav National Park. Bled and its surroundings, are steeped in history from Roman times, to the Austro-Hungarian Empire and the Front Line in WW1, to Tito and the socialist Yugoslavia until 1991 when it gained independence and joined the European Union in 2004. The currency has changed from the Slovene Tolar to the Euro in 2007. It boasts 100% literacy and English is spoken by almost everyone. Summer activities include swimming, white water rafting, walking, cycling, hiking, boat hire, canyoning, mountain biking, hunting, fishing (exceptional), hiking, ballooning, golf (championship course in Bled), skydiving, flying (Lesce 2km), etc. Winter activities are equally diverse i.e. skiing, snow shoe walking, tubing, sledging, ice climbing, ski touring, skating (indoor Ice rink in Bled), etc. There are several ski locations i.e. Bled (although Bled cannot really be described as a ski resort itself), Krvavec, Vogel, Kranjska Gora, Kobla, or Pokljuka Plateau. (all 30 min or less by car and also served by a daily bus service). Other Ski resorts in Italy and Austria can be accessed in less than 1 hours drive. Places to visit locally: Cliff Top Castle, Vintgar Gorge, Lake Bohinj and Savica waterfall, Radovljica Bee Museum, Radovna Valley, etc. All trips and sport activities can be booked at the reception. Check in is at 12.00 noon, but if you arrive earlier you are welcome to stay in the living room or just leave your bags with us while you go for coffee! Check out is at 10 am! The office is closed between 1 p.m. and 4 p.m. CONTACT US IF YOU ARE ARRIVEING BEFORE 8 A.M. OR AFTER 10 P.M.
We accept Visa and Mastercard, although we prefer cash. Credit card payments are subject to a 10% surcharge. Please note that the tourist tax is not included in the price (1,01 eur/person/night). Hostel is located 500m from the main bus station. Go up the hill with the castle on your left hand side.Stick to the right side of the road all the way to the top of the hill. When you arrive to the main road,turn left and you are at our front door. Taxi service is available from both train stations Bled(3km) or Lesce-Bled (5km). There are more directions available on our website. Contact details are printed on your booking confirmation.